Yesterday we said goodbye to V Creek Snowflake. Snowflake was our oldest ewe. 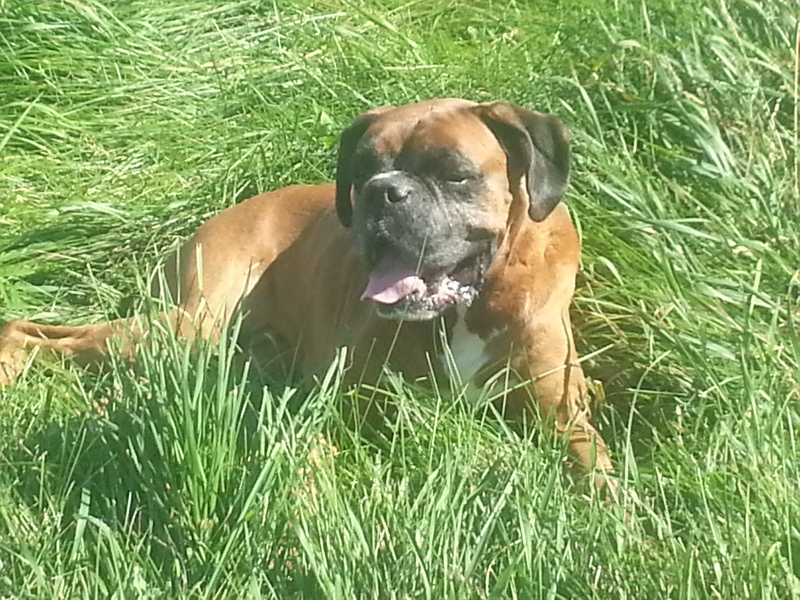 She would have been 11 in the spring. We babied her this winter, feeding her extra rations, and checking and double checking on her in the coldest weather. Snowflake had come to us rather shy, and although she never seemed to want to be pet the way some of our other sheep did, she was friendly in her own way. Snowflake will live on in the three offspring she has which live at Emancipation Acres: Emancipation Inara, Emancipation Abbie and Sommarang Eva.Snowflake’s lambs never disappointed. She was an excellent mother, who consistently produced excellent lambs. I am glad to have her lambs to remember her by. We will miss you Snowflake! Snowflake and her 2013 lamb, Abbie. Chowing pumpkin with Emancipation Katniss. Last year we had two rams, this year we have four, so we had to build two more breeding pens. Breeding groups were put together in the middle of November and the boys are delighted. Our ram, Sheltering Pines Bug really, really gets into breeding season. Other times of the year he is like a sweet puppy, but during breeding season he is all business. Bug has an amazing fleece, good confirmation, and his lambs are always the friendliest. I could see myself keeping a son of his. 1. Firth of Fifth Sakadah- Sakadah is a gulmoget(my favorite!). Last year she had a black ewe lamb named Sookie. With Bug she should have a gullie or a solid black. Fingers crossed for more gullies! We retained her ewe lamb from last season. 2. Sommarang Comfrey- Comfrey is one of my older girls, this year she is eight. Last year she went to Levi, so this year I put her with Bug. Comfrey has nice babies and so far I’ve retained both the ewe lambs I’ve gotten from her (Katniss and Bethesda.) I’m expecting black babies, and would be thrilled if they had yuglet markings. 3. Lil’ Country Bailey- This is probably my favorite ewe. She is from polled lines. has a lovely fleece, nice babies and is as sweet as pie. I wish all my ewes were as gentle and people-centric as Bailey. 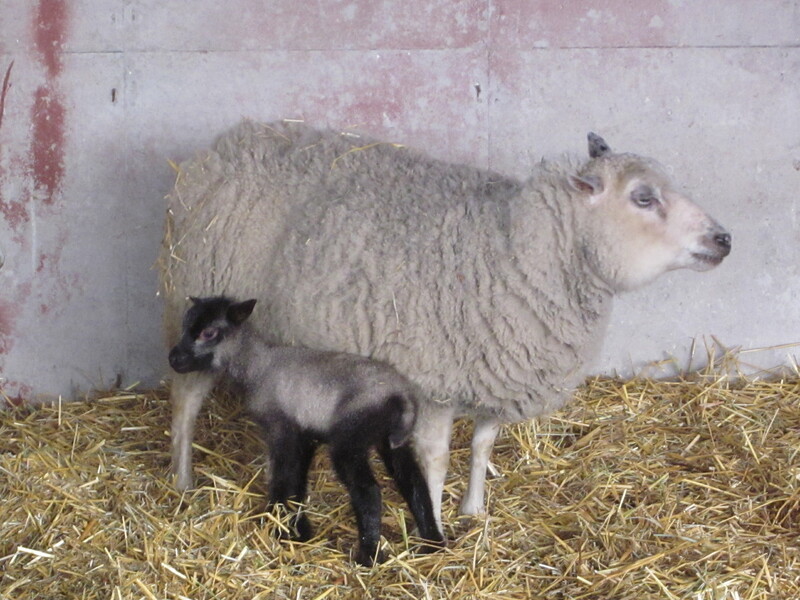 We retained one of her ewe lambs from last year, Cleo, who is moorit. 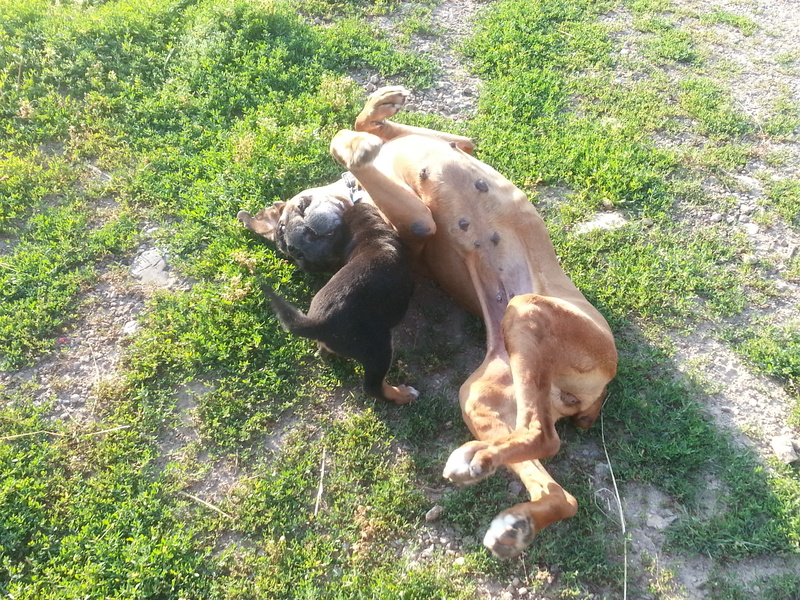 Babies from her and Bug should be either katmoget or moorit as Bailey carries moorit. 4. Lil’ Country Victoria- Victoria’s fleece needs some improvement and I think Bug is the ram that can give that to her babies. Both parents carry spots, so I am hoping for something flashy. 5. Under the Son Sula- I am hoping for more flashy, spotted babies from this pairing. 6. Sheltering Pines Jadore- What can I say, I love Stephen’s sheep! 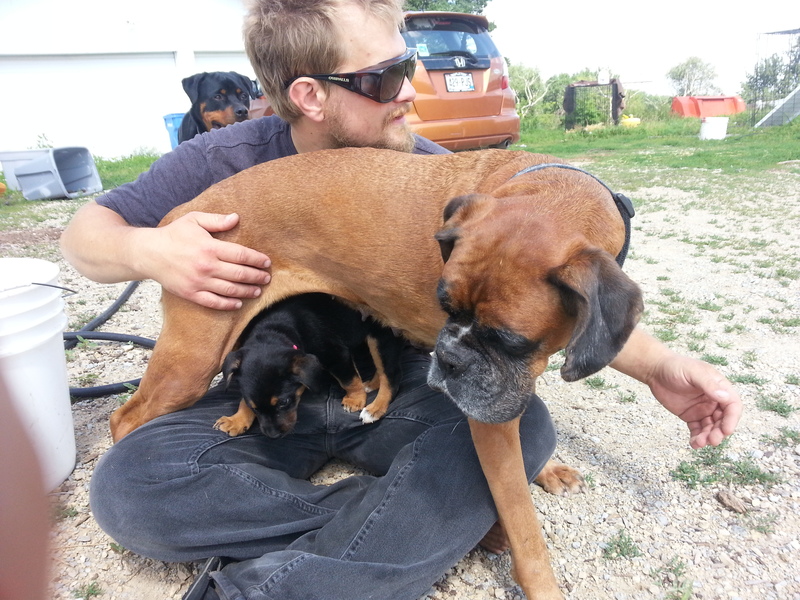 Jadore is fawn (modified) and Bug carries modified. I am hoping for more modified from these too. 7. Sheltering Pines Temperance- Temperance and Bug have produced offspring before (not at my farm) and they had a shaela. The shaela color is a beautiful steel gray and it is a very rare color. I’ve got my fingers crossed for a shaela ewe lamb! 8. River Oaks Ginger- Ginger is another very sweet sheep. 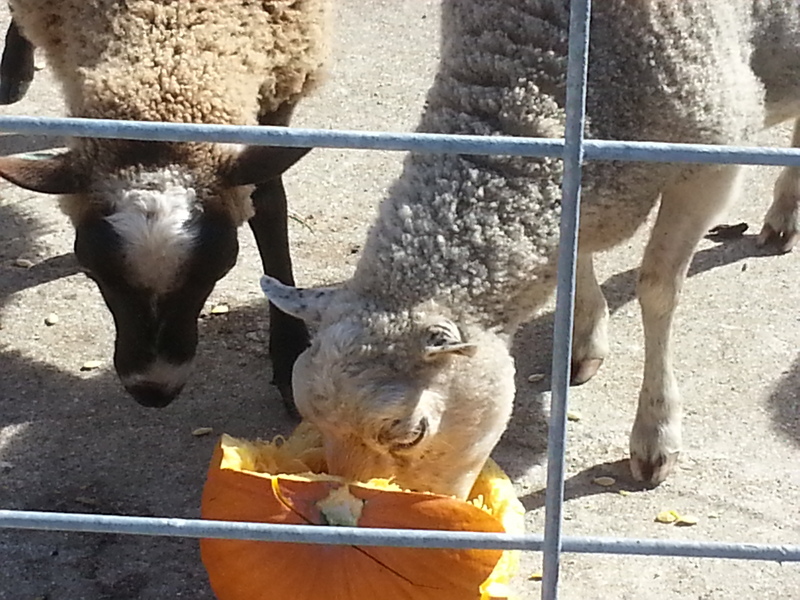 Bug often has friendly babies, so I am hoping for people-friendly sheep out of these two. They could be spotted too! 9. Emancipation Inara- Our first year breeding we kept only two ewe lambs and Inara was one of them. She is finally old enough to breed and I am excited to see what she produces. She is very friendly, and one of my favorites. 1. Ok Acres Tina- Tina is a Bug daughter we bought at the same time we bought Bug. Silly, I know, but I am a fool for friendly sheep. Tina is sweet and beautiful. I imagine her lambs will be black. 2. 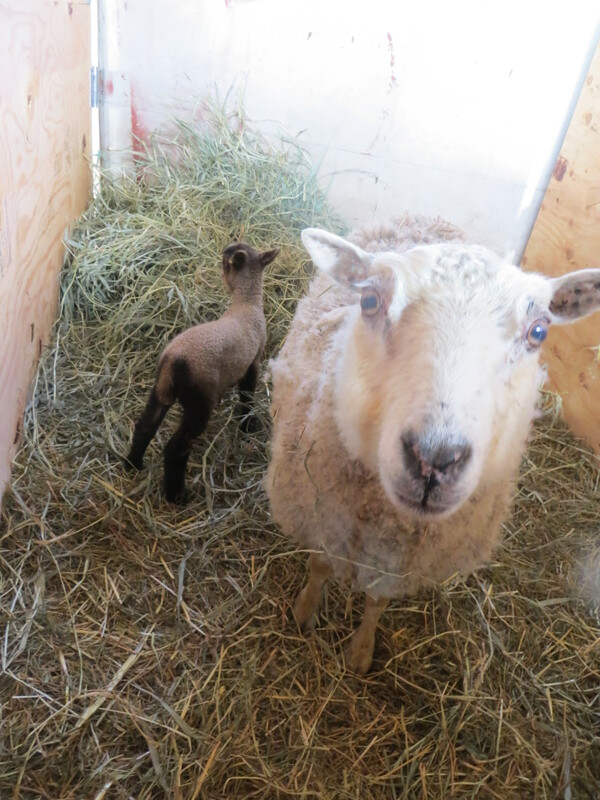 Lil’ Country Acres Crow- Last year Crow went a little crazy–she gave birth to her own two lambs, and then proceeded to abandon them in favor of some week-old lambs she tried to steal from their rightful mother. Hopefully, for her sake, this year she will get it right. Her babies will likely be black with spots. 3. Sheltering Pines Lotus Moon- One of my only white sheep! I would love some cute white ewe lambs out of her. 4. Under the Son Sonora- Another white sheep I am hoping for keeper white ewe lambs from. 5. Emancipation Katniss- Katniss is Comfrey’s daughter from two years ago, and this will be her first lambing year. Katniss is spotted and I am hoping for spotted babies from these two. 1. Sommarang Dawn- Dawn and Bailey fight for the position of My Favorite Sheep. Dawn is sweet and friendly. I’ve loved every lamb Dawn has ever had. We retained one of her ewe lambs from last year, Ostara. 2. V Creek Snowflake- Snowflake is my old lady at ten years old. She herself is not the most beautiful sheep, but her babies are always stunning! I’ve retained her daughters from both years we’ve bred her and just bought another one of her daughters, Eva, from Garrett. You can tell, I love Snowflake. I’d like more sheep from V Creek too! 3. Sheperdwoods Ester- Ester’s coat is coarser (but not coarse) than I would like given her age. I liked her ewe lambs from last year and we kept Priya. I wanted to see what Jean Luc could do to improve on her fleece. Ester is very friendly. 4. Under the Son Senja- I bought three sheep from Under the Son farm and I wanted to give one of them to each purebred ram. Eino is the Finn ram I am borrowing from Garrett. He is a bit bigger than the Shetlands. 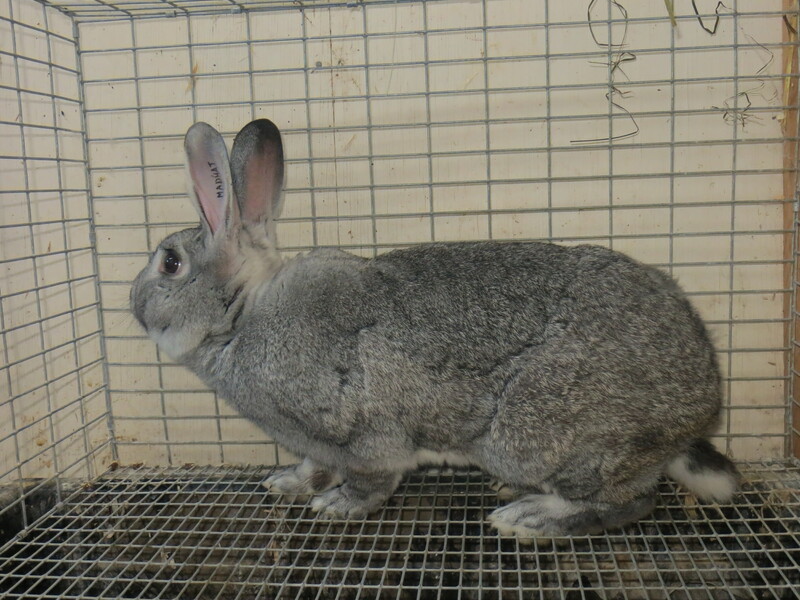 Finn’s are in the European Short Tail class the same as Shetlands. I am hoping for meaty, quicker growing cross breds for meat lambs. 1. River Oaks Freya- Freya is a big, robust girl. I WANTED her to go to Bug, but she somehow SCALED THE CATTLE PANEL FENCE and I found her with her big booty pressed up against Eino’s pen. 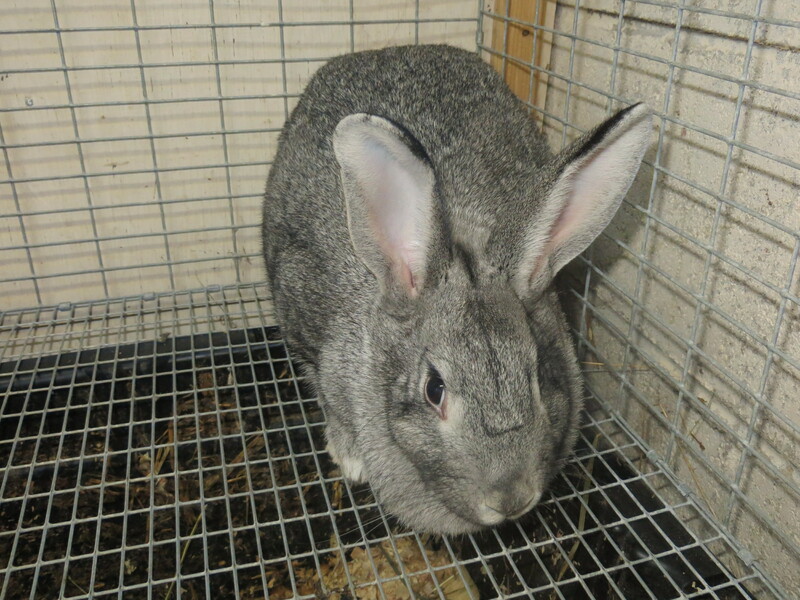 I had just gotten Eino and a few other girls so they were still in quarantine. The easiest thing to do was just let her in with them, so that is what we did. She can go to Bug next year I guess. Sigh. 2. Fiona – Fiona is a cross bred ewe I got from my friend, Kelly. She is a TANK. 3. Obara- Obara is a cross-bred ewe from Cynthia. She is another very friendly sheep. She follows us around like a dog, and we sometimes call her Obara-In-The-Way as she is always underfoot. 4. White Pine Koosi- I got these last three sheep from Garrett and they are all so pretty. I had planned to divide them up between the purebred rams, but I wasn’t totally sure they had been celibate during there time in quarantine. I quarantine any new sheep that come in, but the divider between the ram and the ewes wasn’t the strongest, and once Freya managed to fight her way over to the pen I decided it would be easiest to just put them all together for the breeding season. 6. Eva- This is the Snowflake daughter I bought. She is a beauty. 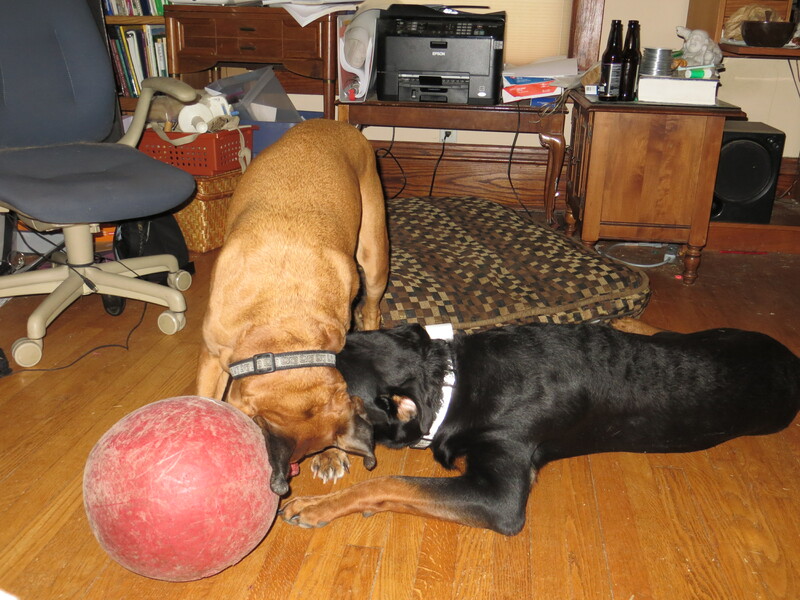 More than four years ago I thought I wanted a mastiff. I lived in the north west suburbs of Chicago, with my then boyfriend, now husband, Joel. Joel had moved with me to Palatine when I got teaching job there. We lived together for about a year when I sat him down and told him I didn’t think I could live much longer without a dog. We’d lived an in apartment a year before that, and now, a year later, we were in a house. I’d lived with a dog since I was four and it was killing me to be without one. Joel has allergies, but said he would try to get used to a dog for me. That summer Joel went away to Tennessee for two months to get his Permaculture Design Certificate. He agree while he was gone I could get a dog. I thought at the time I wanted to get a mastiff. 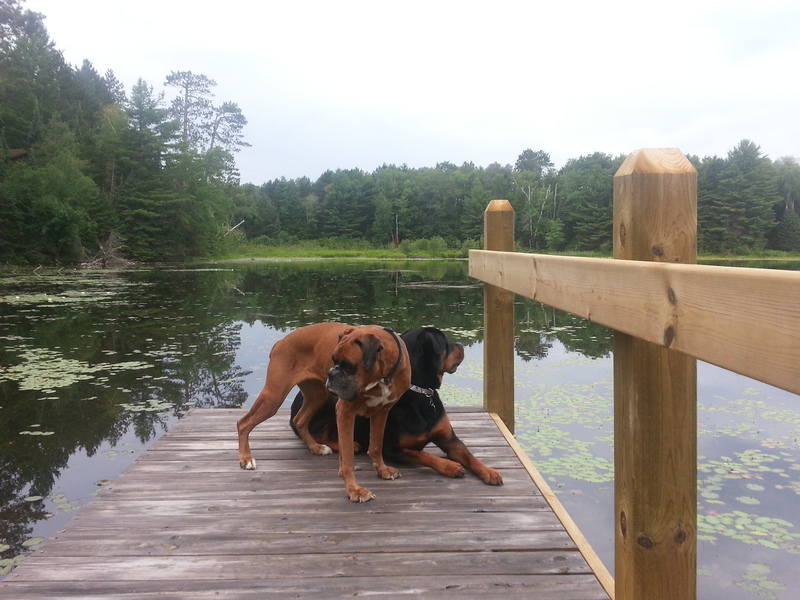 I contacted local rescues and got major run around, un-returned calls ect. I found a lady in La Salle with a mastiff and my dad and I drive down to visit. The dog was 300 lbs of untrained. 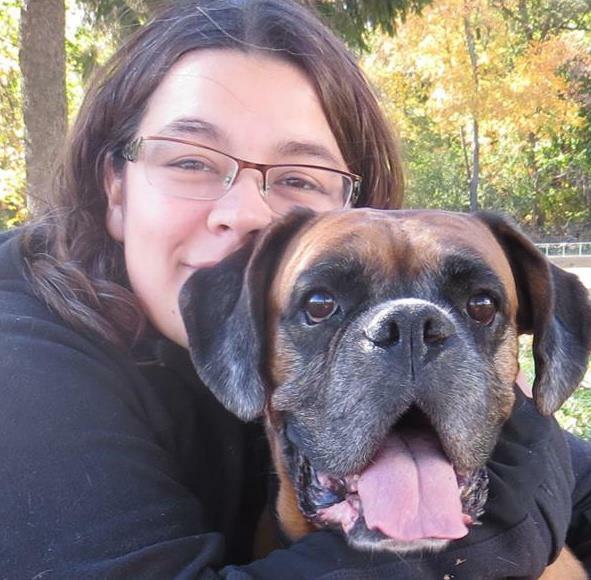 He was sweet, but didn’t know how to walk on a leash, liked to put your arms in his mouth and had been taught to “give hugs.” I knew I could not bring that dog back with me to the suburbs. Back at my dad’s condo in Rockford I was mopey. I wanted a dog, dammit! My dad finally said something to me along the lines of, “Maybe a mastiff is just to much dog for you right now. 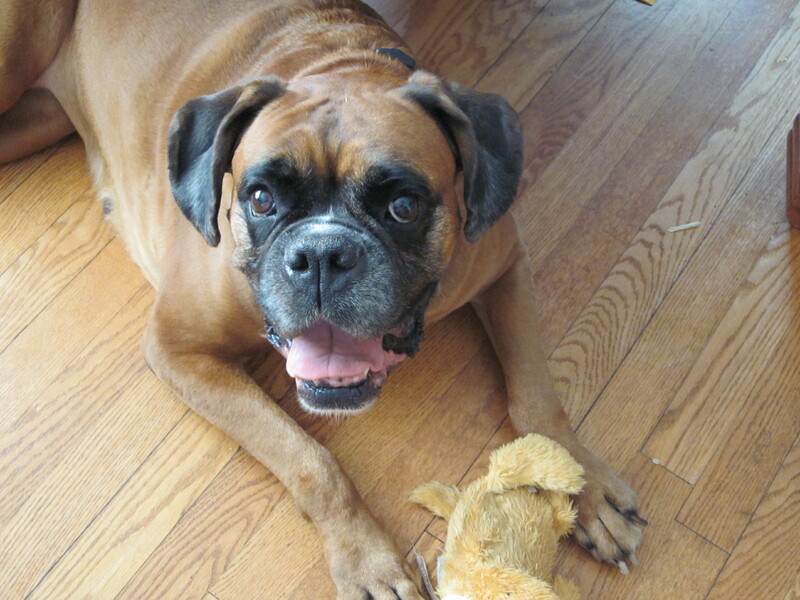 Maybe you should get a boxer.” I started looking on Petfinder right then and as I was scrolling through the profiles a dog named “Sweetie” caught my eye. Her long jowls, and liquid eyes made my heart skip a beat. She felt like my dog already. Soon after I visited her at the shelter in Chicago Ridge with my friend Julie. At least at the time Chicago Ridge was the biggest dog rescue in the area. Entering the dog room was deafening. We took “Sweetie” out of the cage for a walk outside away from all the chaos. As we walked down the aisle between the rows of cages all the dogs went wild, throwing themselves at the bars and barking their hearts out. “Sweetie” looked straight ahead, she never barked, she never even looked to the side. She walked like a princess. We got outside and it was hot. She had horrible diarrhea and was so skinny her ribs were showing. She had obviously been nursing puppies recently. 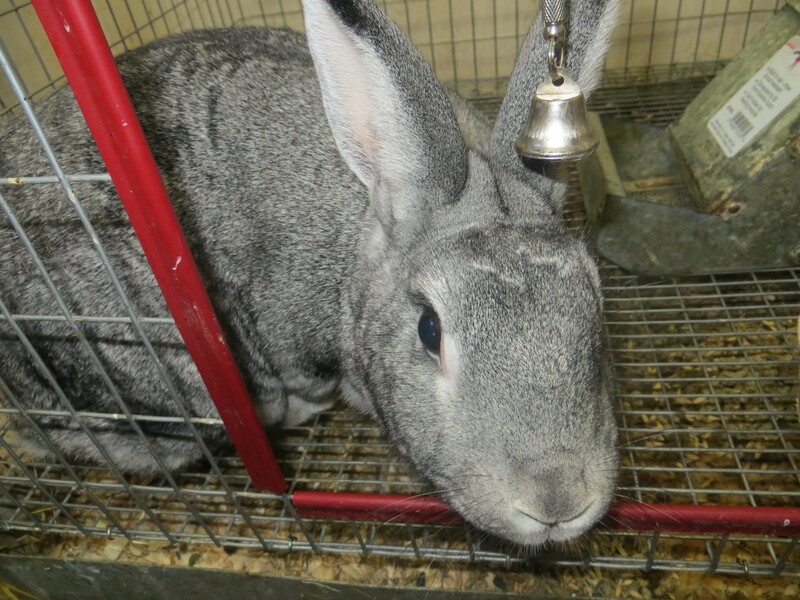 Her teeth were horrible from chewing on the bars of a cage all day. She was skinny and had been picked up off the street. Something about her would not let me look away. I didn’t look at any other dogs. She needed to be spayed before she could go home so I had to wait a few days before I could take her home. On June 24nd 2009 “Sweetie” came home with me and became Sansa. The name Sansa is from one of my all time favorite series of books, A Song of Ice and Fire by George R. R. Martin. In the books, Sansa is a sweet, gentle girl, naive, who is forced by circumstance to grow up fast. She is from a proud, royal house. Although Sansa isn’t my favorite character in the books, her name seemed to fit my new friend. I thought about the way she held her head up high as she walked down the aisle of frenzied canines, and I knew, she was royalty, she was Sansa. This is a photo of Sansa from one of the first days I had her. She is staring very intently at a photo collage my mom made for me of our family. In July of 2009 I found the first, of many lumps in Sansa’s mammary glands. We had it removed and it was benign. I feel head over heels for Sansa. She was the gentlest girl, so obedient and so sweet. 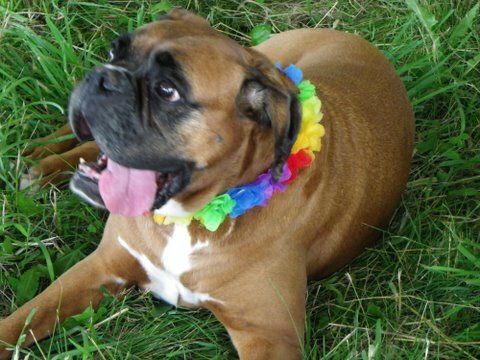 Her vets at Banfield called her “the calmest Boxer we have ever seen,” and they used to fight over who got to be her vet. 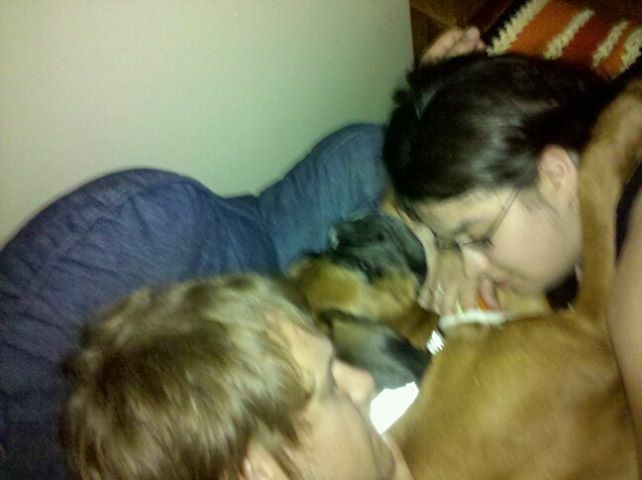 When Joel came home from Tennessee it was a bit of a surprise as I thought he was coming home the next day not at 3am. Sansa was ready to defend me and she took several minutes to calm down. I knew she would do anything to protect me, and I vowed I’d do anything to protect her. Sansa made her first dog friend, my dad’s dog, Chani. 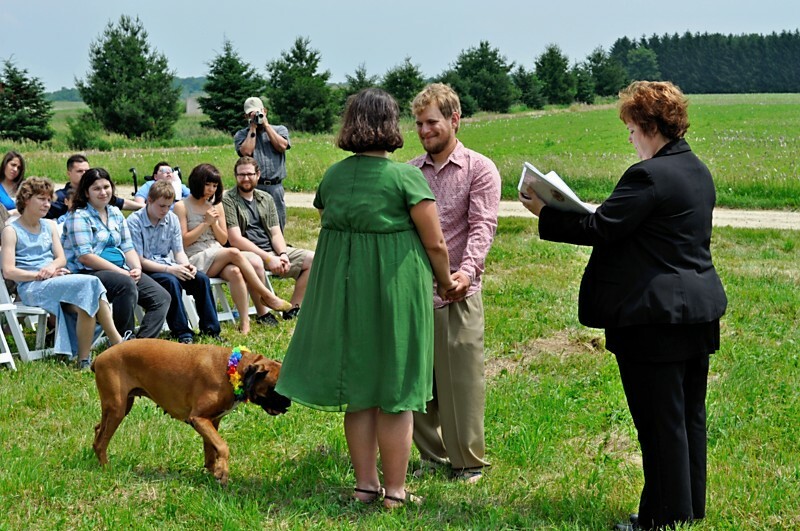 In 2010, I lost my job, we decided the suburbs sucked, and we bought a 40 acre farm in Wisconsin. Sansa didn’t handle the move well, she developed a lot of separation anxiety and twice jumped out a second story window when we left her alone. 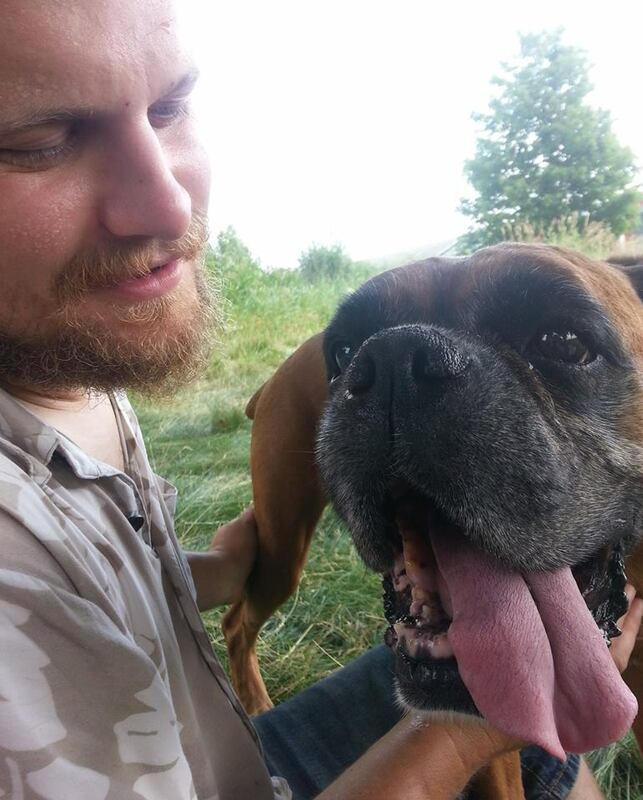 We worked with her, loved her, and with medication and time, she realized we were not going to abandon her. My wonder dog! She had already dodged the breast cancer bullet, and then she jumped out out of two second story windows and only scratched her chin a tiny bit. 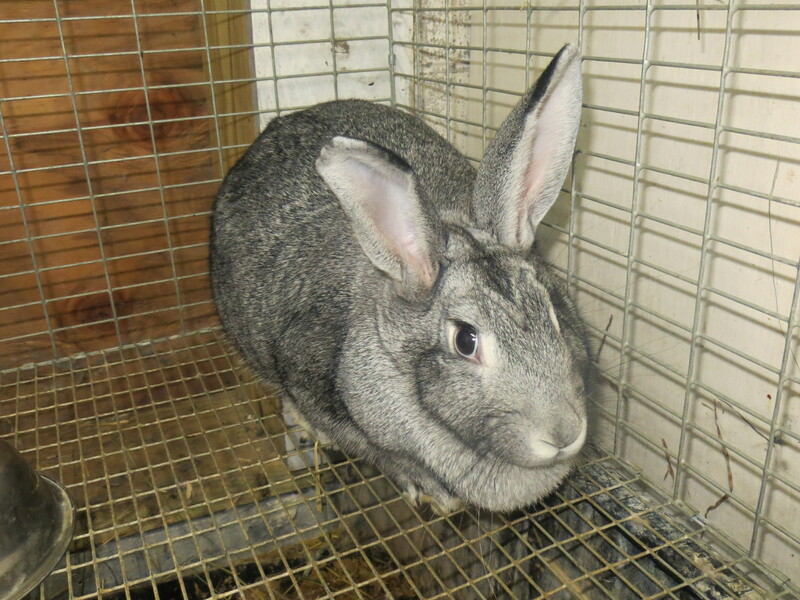 One of the first animals we got were rabbits. 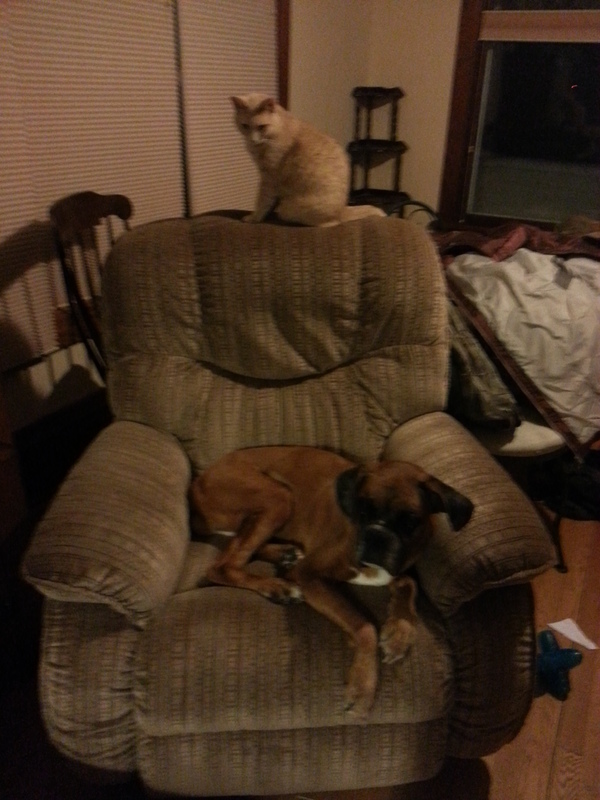 Sansa loved to lay by them. Later when we built my colony she would come inside and sniff them. 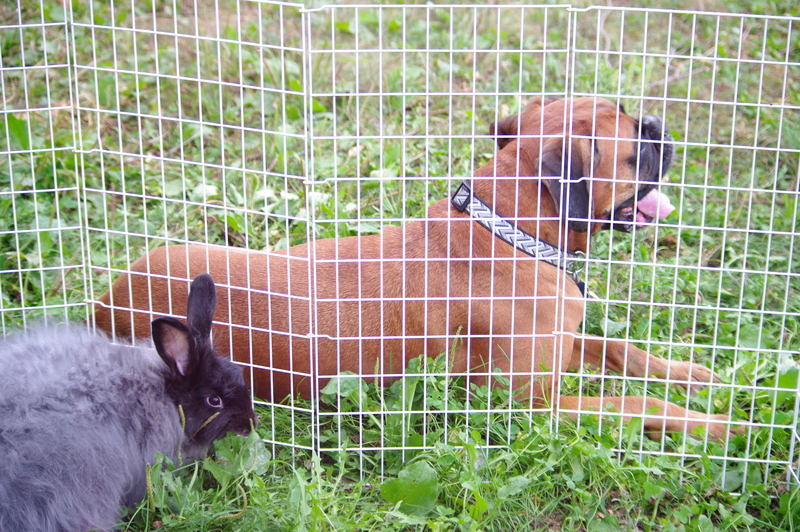 The rabbits never minded her. She always radiated such calm, gentle energy. 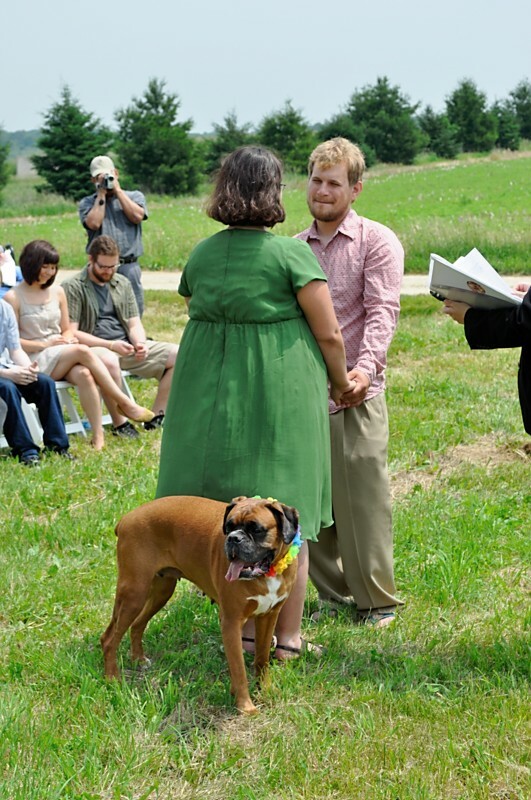 In June of 2011 Joel and I got married. Sansa was our flower girl. She stood right up there with us. 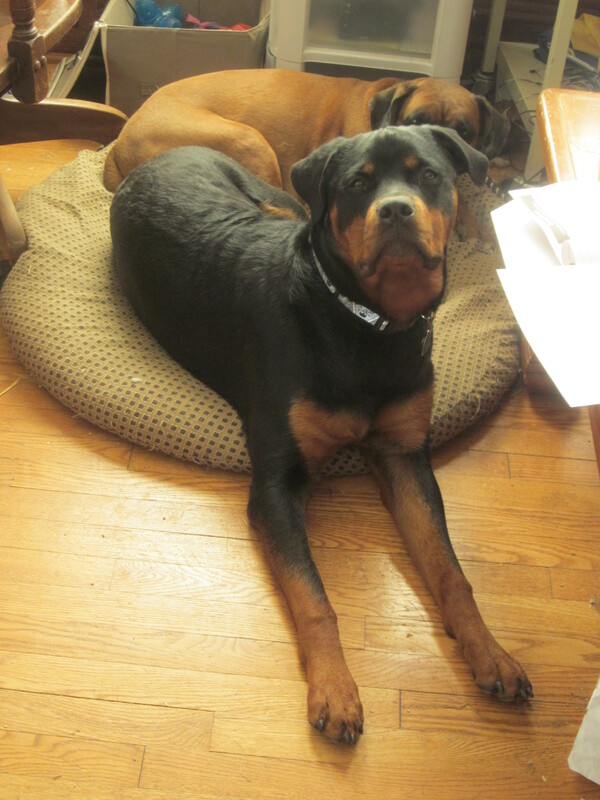 In July 2011 we added a little Rottweiler puppy, Drogo, to our family. 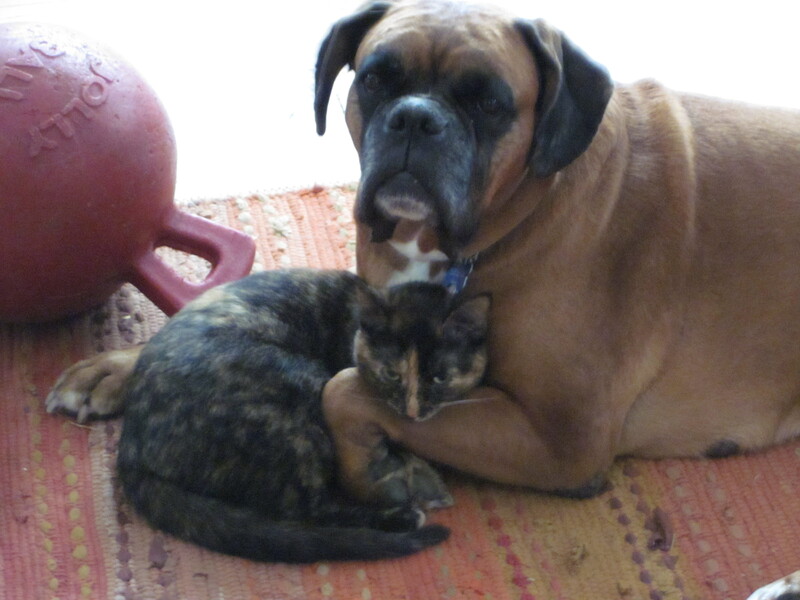 I was worried he might boss her around as he got bigger, but despite being twice her size she kept him in line till the day she died. 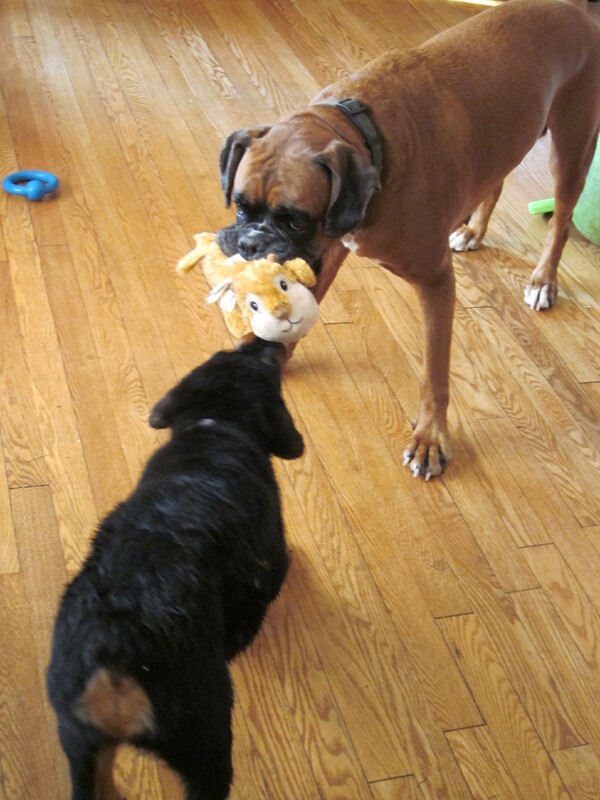 Sansa and Drogo loved each other, and would love playing tug, or chasing games or just lying together. Sansa loved to steal his bones and toys and mound them up underneath herself like Smog from Lord of the Rings. Even though she liked to win, Sansa also liked to share. Everyone loves Sansa, even kitties! Joel and I joked that Sansa was my familiar, because she was my shadow as well as my protector.If we were outside and Joel was taking the dogs in but I was staying out Sansa would always take forever to go inside. She would stand and stare at me, and finally, slowly, walk inside. If I feel asleep on the couch watching a movie and Joel went to go upstairs (he didn’t wake me up cause I am a jerk when I am woken up) Sansa would refuse to go upstairs with him but instead would stay downstairs with me. When we walked through an area heavy with thistles, I would tell her, “Sansa, walk behind me.” And she would. 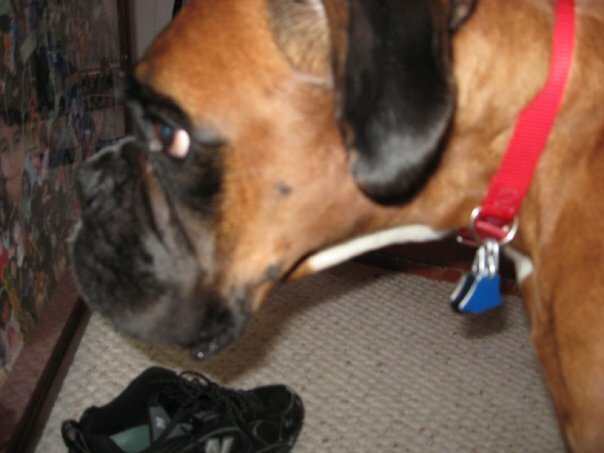 When I cried into her soft brown fur when I was sad she always gave me this somber look like she understood. I’ve never met a sweeter, more gentler soul. Right where all the lines of her face came together, between her eyes was a little spot I called her “kiss spot.” When I kissed her there the rest of her face cradled mine and It fit like It was made to be there. Most dogs stink, but Sansa never did. She had a sweet smell, and even if it wasn’t entirely accurate Joel and I started to say she smelled like a fresh baked cookie, hot out of the oven. 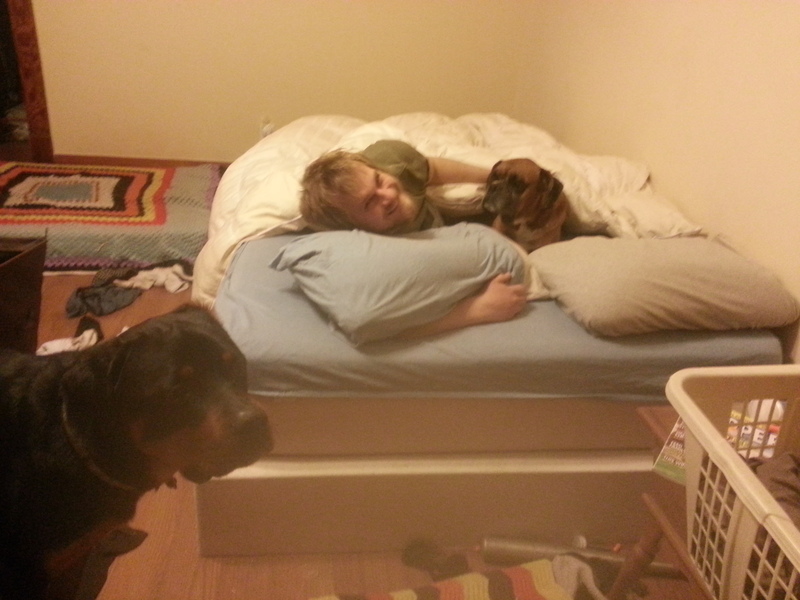 Even though Joel is allergic; Sansa, Joel and I would often cuddle in bed. I told Drogo over and over again as soon as she stopped regularly eating poop, he could join us. He never has. When Sansa lost some mobility in her back legs she started having trouble with stairs. Joel is notoriously difficult to wake up but each morning he would jump right out of bed to carry Sansa down the stairs. Nothing I’ve ever done has got him up so fast. But thats how much we loved Sansa. We fit our lives around her. We changed to make her more comfortable. 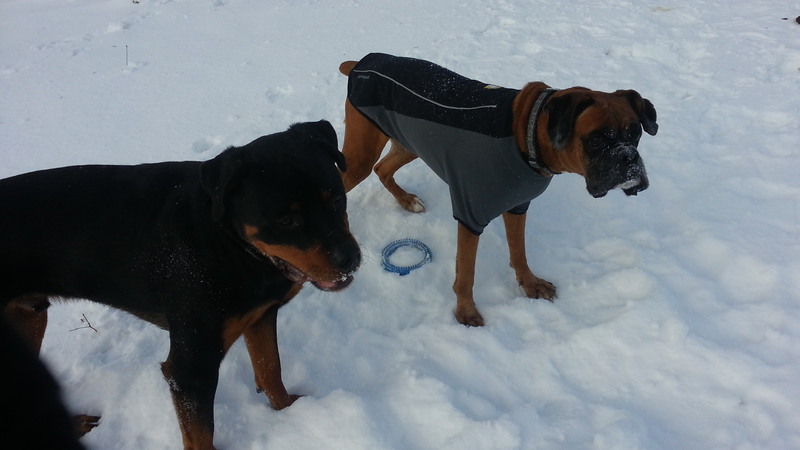 On October 1st 2012 Sansa was diagnosed with lymphoma by the University of Wisconsin Medical Teaching Hospital. Joel and I were devastated. 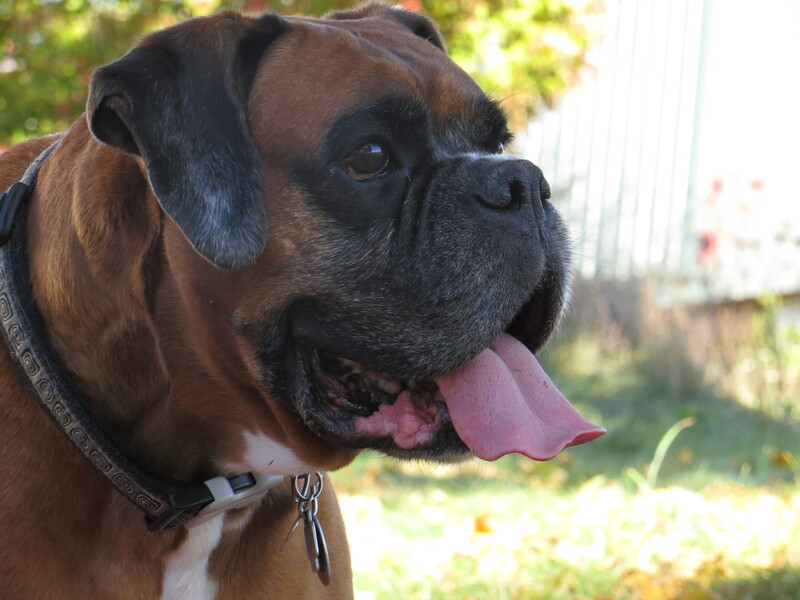 The doctor’s explained to us that chemotherapy is often very well tolerated in dogs, as dogs are given a much lower dose than people and the emphasis is always on making their quality of life good. Without chemo they gave her a month to live at most. We decided to do chemo. Every visit required blood work before the chemo. Our visits were usually at least four hours long. We waited together, and I always brought her a blanket to lay on. It was like a miracle! Sansa did well and seemed like her old self! Sansa finished chemo and had a full remission for three months. She came back for a check up with what we thought was worsening arthritis. 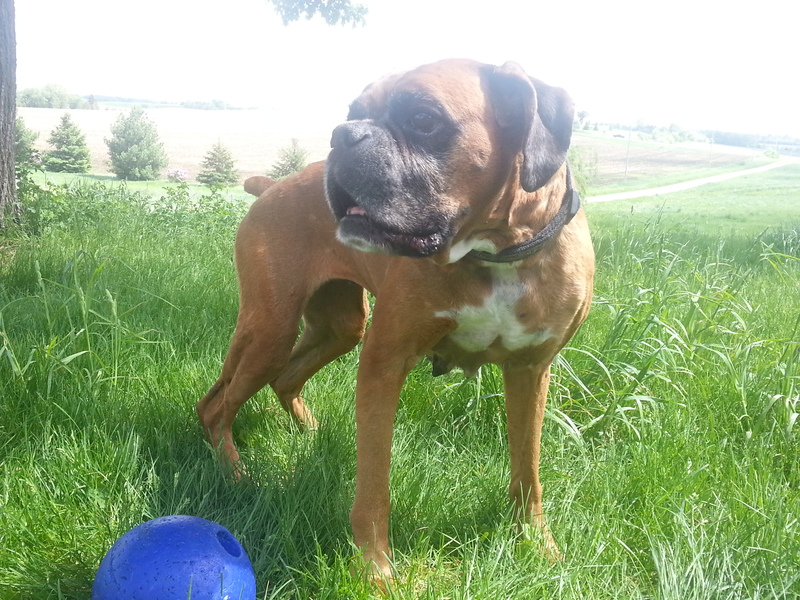 Within days it had worsened, and the vets thought the most likely thing was a lymphoma tumor in her spine and one in her brain. They gave her some Elspar, and again, we had a miracle. She did okay with the next round of chemo, but then her liver values spiked, and she developed tremors of unknown origin. It didn’t seem like there was anything else medically to be done for her, and the pain meds no longer seemed to be working well enough. 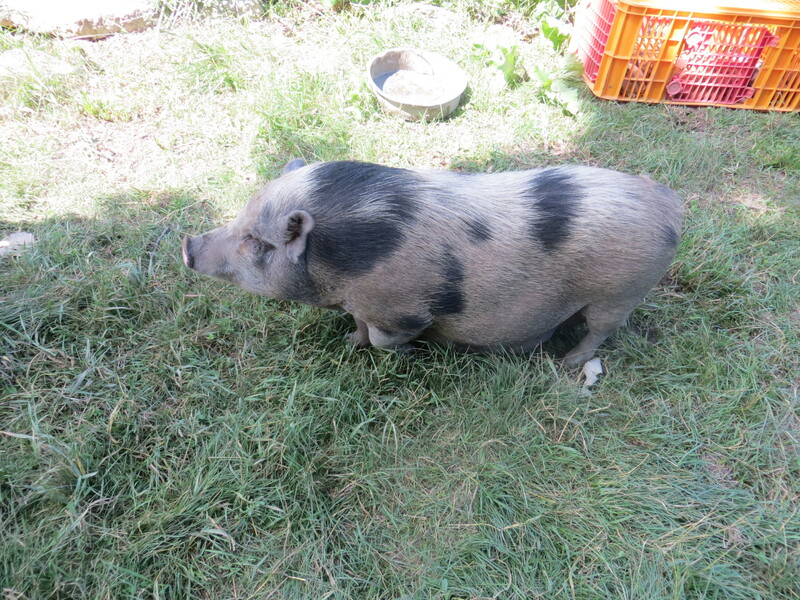 On September 30th 2013 we fed Sansa a lunch of Emancipation Acres pork and said goodbye to her in our home. 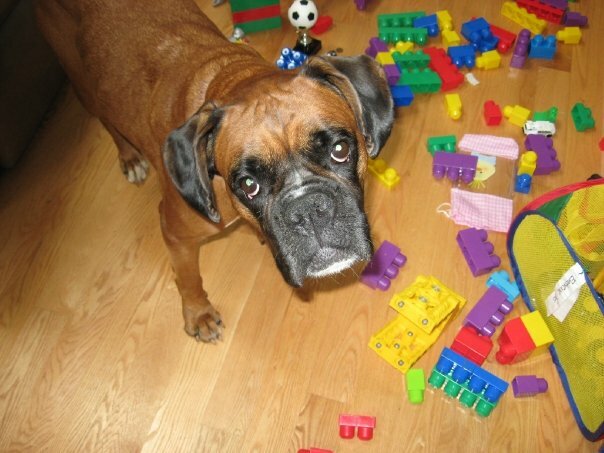 We buried her outside, in the spot where I have so many pictures of her playing with her Jolly. I wrapped her in the blanket she always slept on in the car, and put her two favorite Jollies in with her. 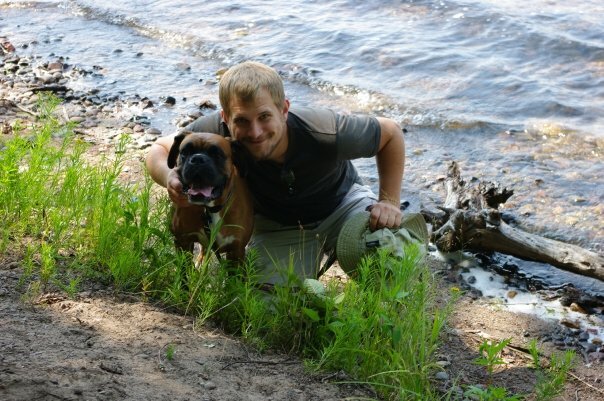 Losing a pet is kinda like cleaving your heart in two, and being left with the smaller half. I love Sansa, like I’ve never loved a pet before. I love her gentle spirit, her friendship and all the things she taught me about love and being brown. I will miss her to the end of my days. Saying goodbye to her was the hardest thing I’ve ever done, or probably ever will do. I am grateful for all the good times we had together. I wouldn’t trade them for the world. I am also deeply grateful for the top notch veterinary care Sansa received. While at the UW she had a cadre of specialists, kind vet techs and front desk staff. I don’t think she would have lasted so long without their care and expertise. I am also thankful to my friend Amanda Pike, who answered SO SO many veterinary questions, and who was a good friend to Sansa. I would have conquered villages for you, Sansa, gone on endless quests, and paid everything I had to the UW if it could have saved you. I love you so much. I miss you so much. My life feels empty and stupid without you. 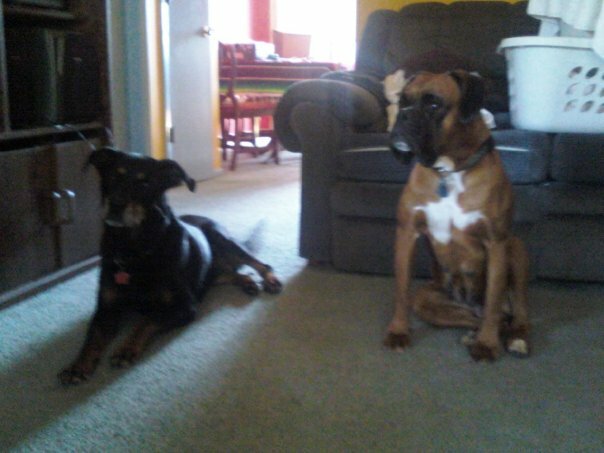 You were the very best friend anyone could have ever asked for. I am so glad I got to meet you, and love you. Thank you for sharing your life with me. You made it better. 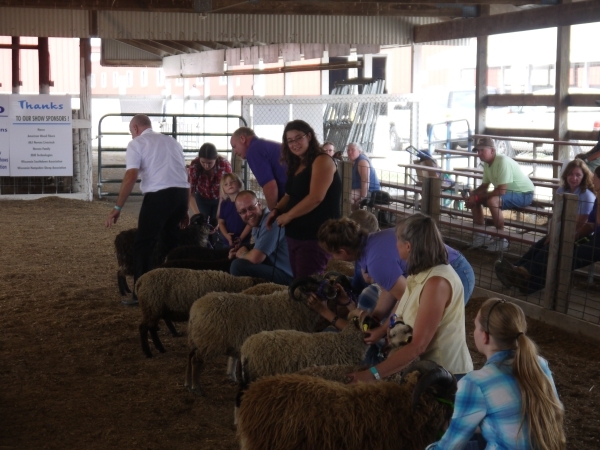 This last weekend was the WI Sheep and Wool Festival! Joel and I had such a great time! On Friday we had the inspection workshop with Maurice Wakeling, a UK judge and inspector. Maurice went over the inspection form for rams and ewes and then we broke into groups to go over sheep with the forms. 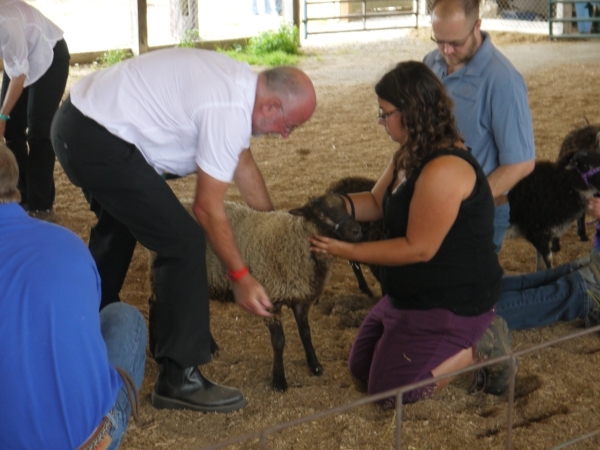 Later the groups presented their sheep to Maurice and they went over them to see if he agreed with their findings. I missed the last part because I had to leave early to go to my friend Amanda’s wedding. It was such a beautiful wedding and Amanda was a beautiful bride. 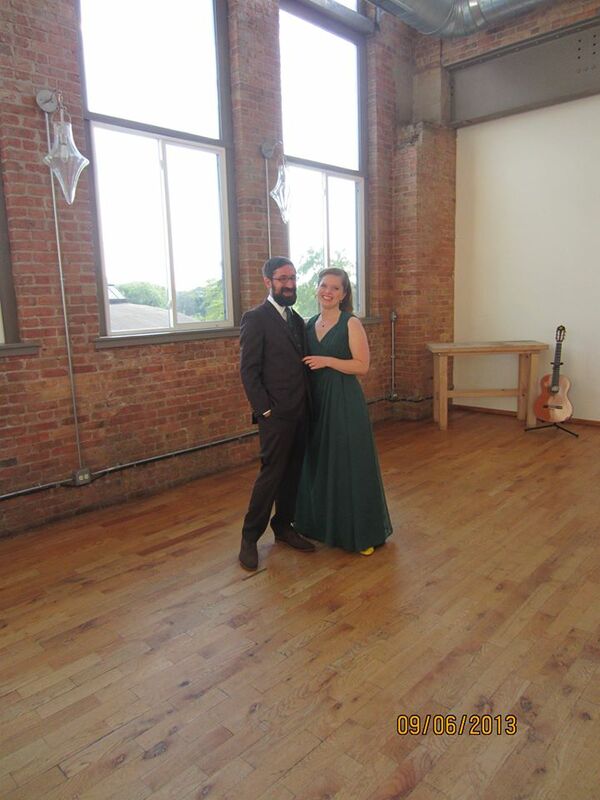 I cried just about a zillion times and we both Joel and I had a really lovely time. 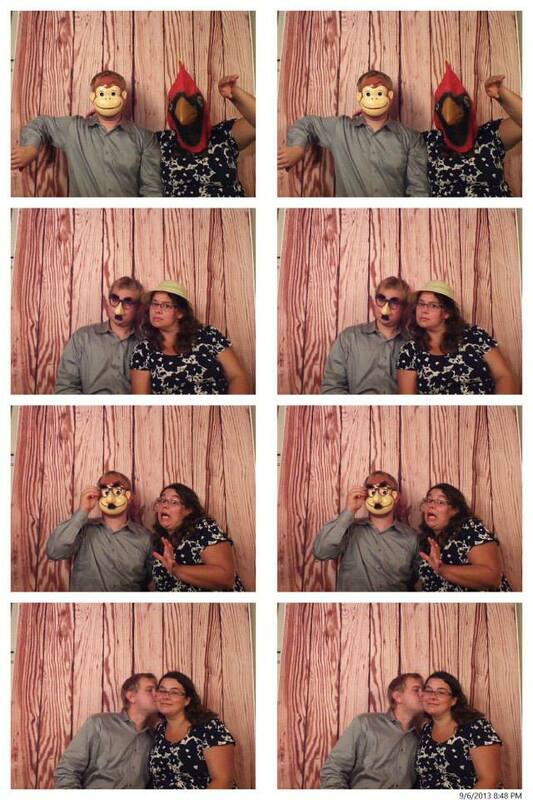 I love a good photo booth! I’m so happy for them I am thinking about crying all over again. Amanda wore green and Anthony wore brown. They both looked awesome! We didn’t get home till twelve and I was up the next morning at 5am. UGH! Gilly Wakeling, UK wool judge, judged the fleece show and I am very sorry to have missed that. The judge for the Shetland show was UK judge and ram inspector, Maurice Wakeling. I showed a senior ewe and a ram lamb. The senior ewe didn’t place but the ram lamb got 3rd out of 18. We bought him from Rich and Jennifer in New York and I am so excited to use him on a few select ewes this breeding season. Yay, Jean-Luc! Here is a picture of Maurice inspecting Jean-Luc. He is checking for softness of fleece, consistency in the fleece, density, crimp, good teeth(on pad), good legs, correct sized head and ears and many other things. 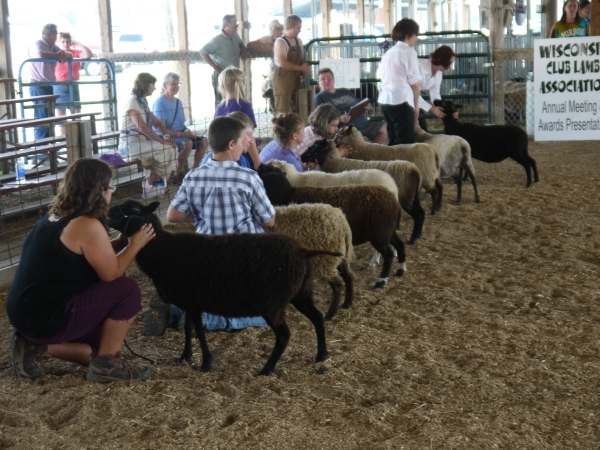 Here are some of the other rams being judged in the ram class. I was so nervous since it was my first time showing. I really had not worked with Jean-Luc as much as I should have, but he stood very still in the ring and acted great when Maurice was looking at him. I was next to Garrett in the show ring, which was great cause he got me smiling and acting less nervous. Here is a picture of Maurice looking over Temperance and the other senior ewes. It looks like Temperance is getting ready to poop. She walked great on the halter at home but was a spit fire in the ring. She kept leaping into the air like a bucking bronco. After the show we had to run home and let out the dogs, and give fresh water to everyone. We came back for the Shetland sheep breeders potluck and both Joel and I had a really great time talking with everyone about the little sheep we love so much. It was really fun to meet people face to face I’ve chatted with some much on fb and yahoo forums. We brought five ewe lambs to sell to the fairgrounds and they all sold! They are going to live in Indiana with a lovely family. I will be transporting them in a few weeks. Sunday I came back to the fair to clean out our sale pen and pick up Gilly and Maurice. Joel and I were lucky enough to have the Wakelings stay at our house till Tuesday when I took them back to the airport. We talked for hours about Shetlands and I learned a lot from them. Both Gilly and Maurice are two of the nicest, most helpful people I’ve ever met. I feel so grateful to have been able to spend so much time with people so involved in the breed as we start out in our Shetland breeding journey. We talked a lot about the differences between UK sheep and US sheep, correct Shetland fleece (single coated, fine, and soft) and Gilly and Maurice were nice enough to look over my keeper ewe lambs from this year, and the two yearlings we kept from last year. Overall they seemed to like them, and gave us some great feedback on the animals we presented which will help us immensely as we move forward. Gilly said she would happily add Inara (Ok Acres Camden x Sommarang Snowflake) to her flock which made me grin from ear to ear! What a great complement. 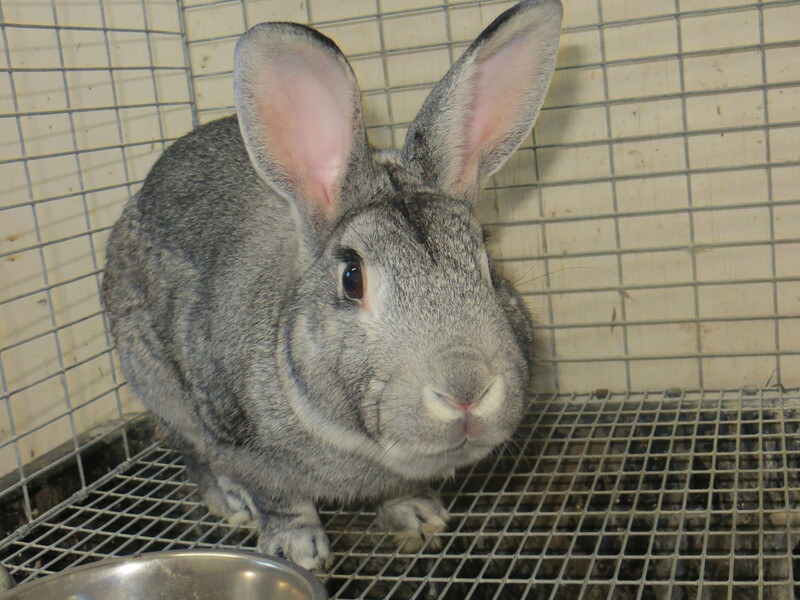 American Chinchillas and Other New Bunnies! I’ve been thinking about American Chinchillas for awhile. 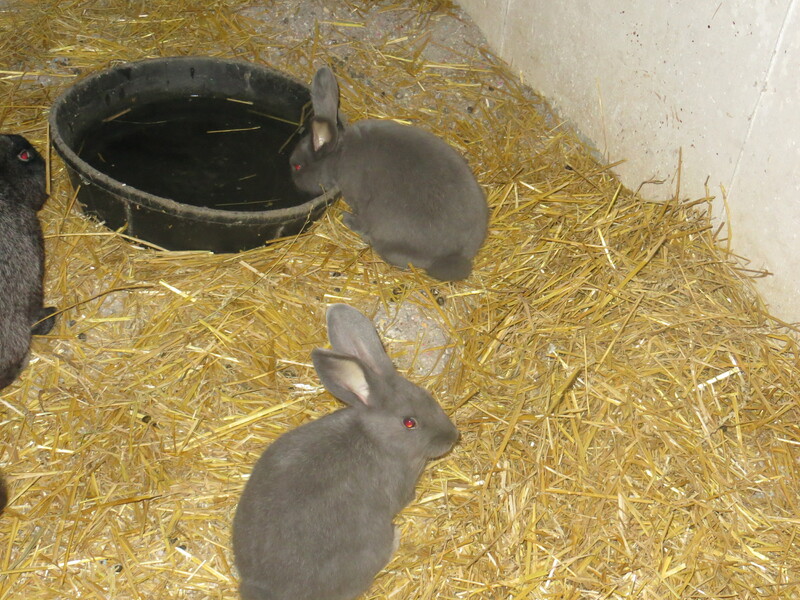 In fact, I wanted them before I got Silver Fox but wasn’t able to locate breeders near me. I started thinking about them early one morning and decided to try to track some down via Facebook. I found the Krienkes, who turned out to be a wealth of information as well as really, really nice. I got three does and a buck from them and am hoping to add a few more does and another buck at convention. 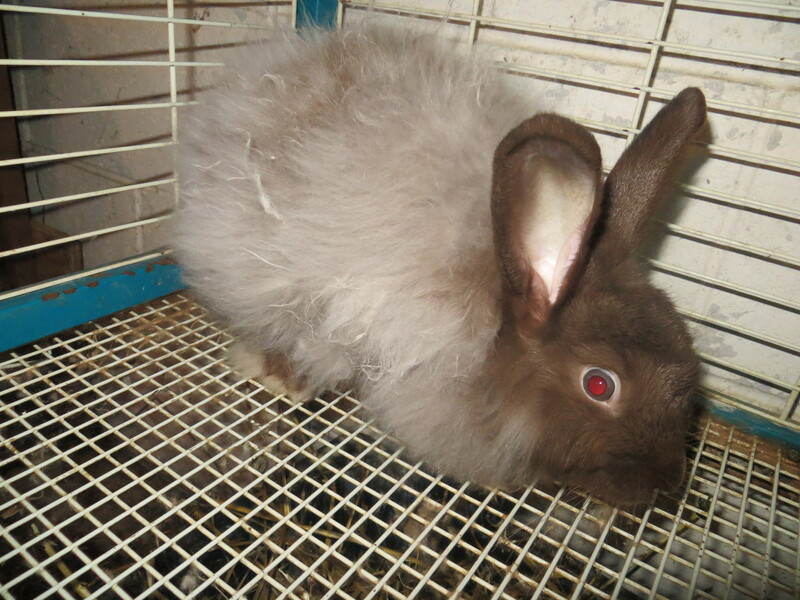 Everyone is in cages right now for quarantine but in a few weeks the does will move in with the Silver Fox does. Crystal’s Sardina- This doe is very sweet. She always comes to the cage door for pats. I don’t like to use the word favorite but…. Violet- Violet loves throwing her food everywhere so I need to get a heavier dish. I don’t know why some bunnies love to do that. Rose- Rose is Violets sister. Here is my new self-chocolate chinchilla from Kate. 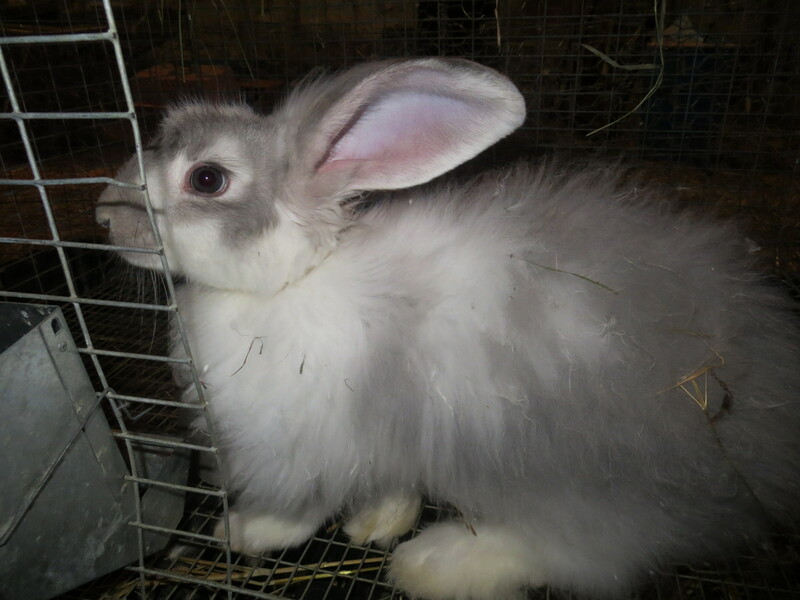 Hopefully she will make beautiful French Angora chinchilla babies for me. Her name is Zora. My blue Silver Fox does. I’m trading one with Katie for another unrelated blue doe. Last but not least, my new buck Harvey. He is a sweetie and the girls are driving him wild!!! 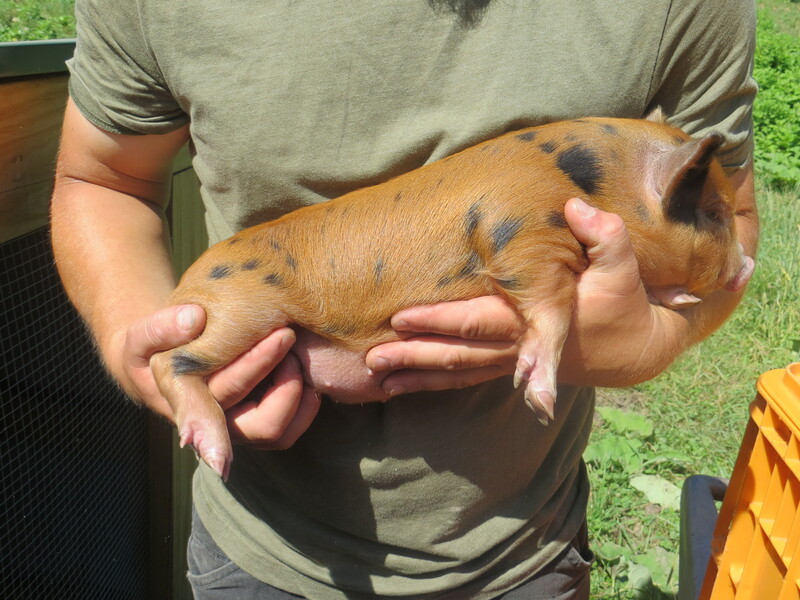 Only one 75% Kune Kune 25% Potbelly Piglet left!!!! 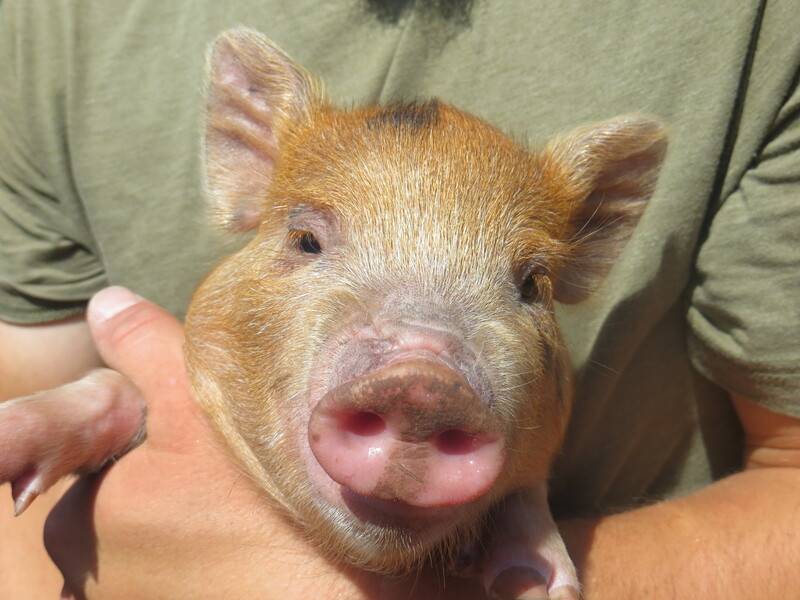 BJ is the only piglet still looking for a home. Her teat structure is perfect and she would make a fine breeder. She is ginger and black. 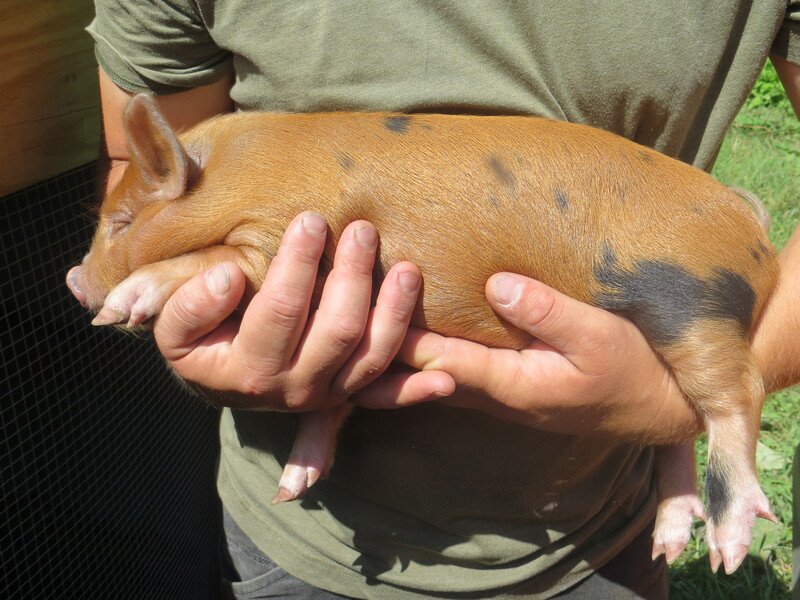 We do have two pigs we are raising for meat and we would be happy to raise one for you. Please inquire. The piglets are a few weeks old now and growing day by day. They really are so cute its a bit hard to handle. Here is the proud Momma, Penny. 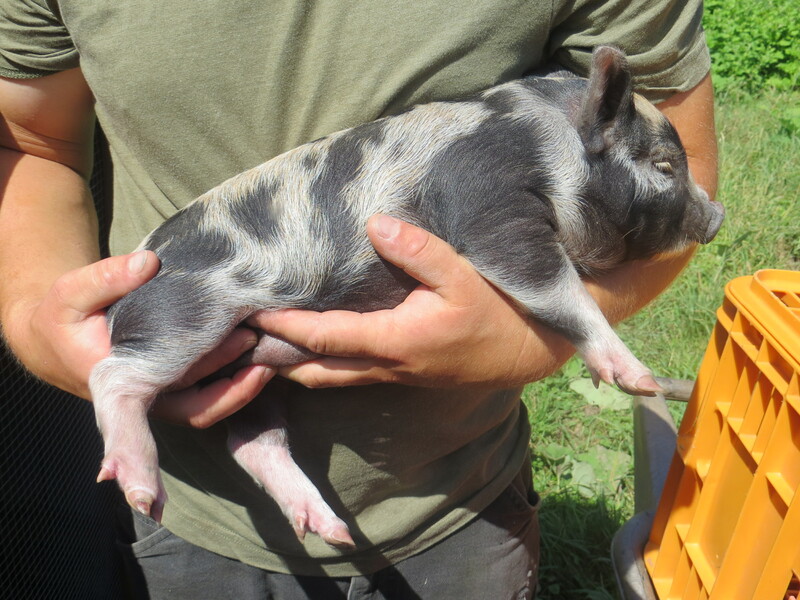 She is a Kune Kune x Potbelly. Penny is the sweetest, most gentle pig we have. She loves being pet and will roll over for belly scratches. This is her first litter. She had nine. 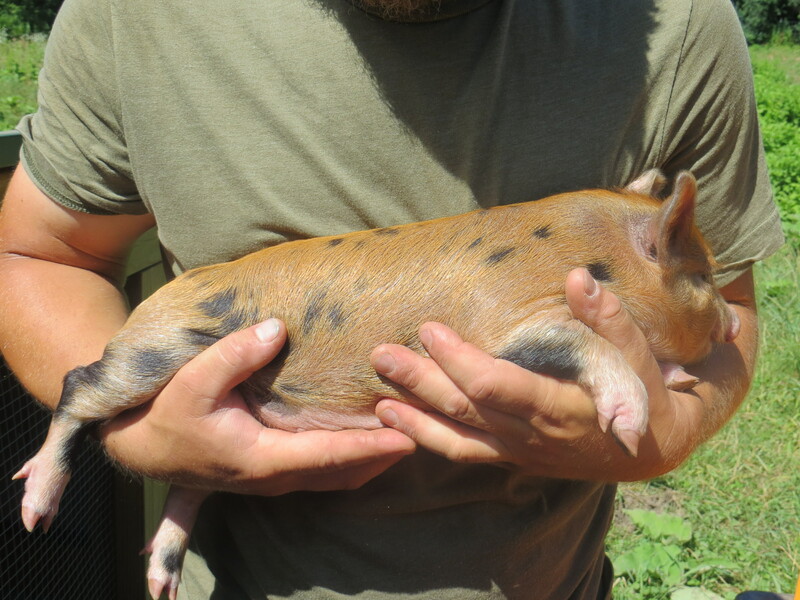 Daddy is Hercules, he is a papered and registered Kune Kune boar. 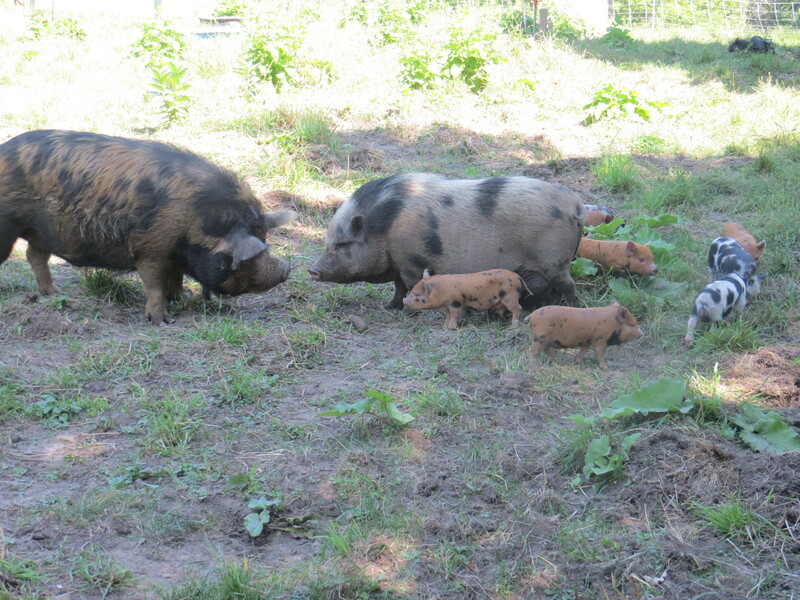 Here he is with his family and some of the other pigs. 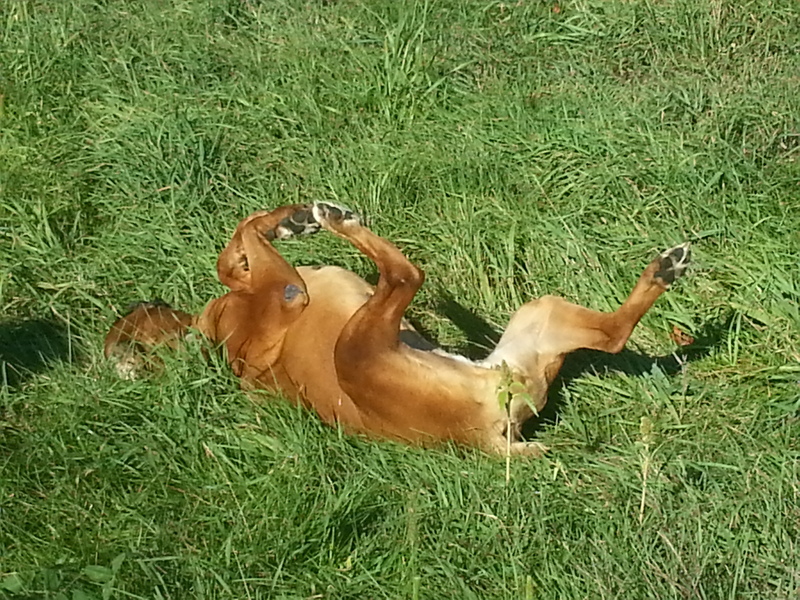 Hercules is a good family man that loves belly scratches and his mud wallow. 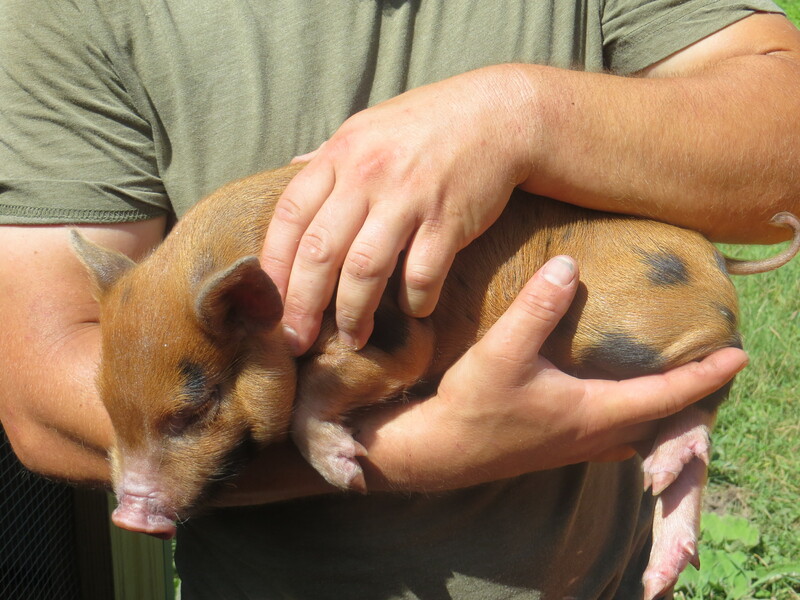 The following piglets are for sale, and can go to new homes in mid-August. 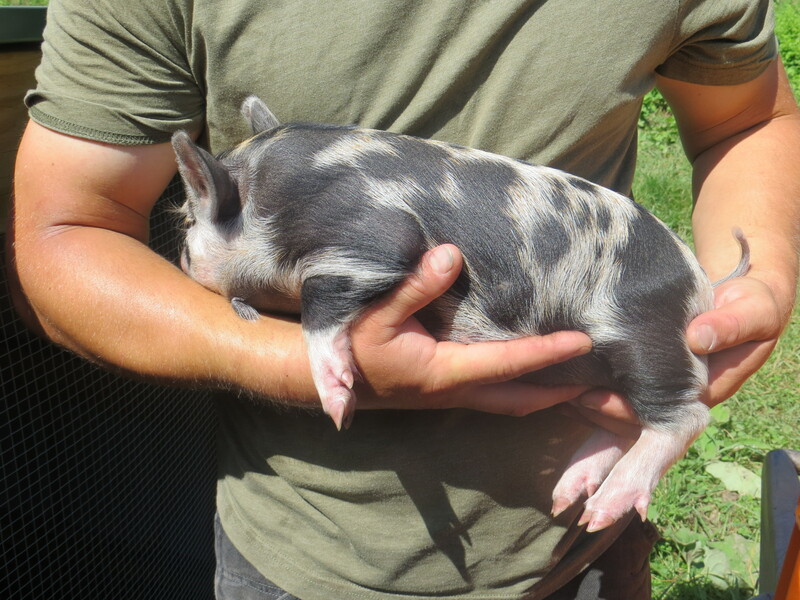 Gilts(unbred females) are $200 and barrows(castrated males) are $100. 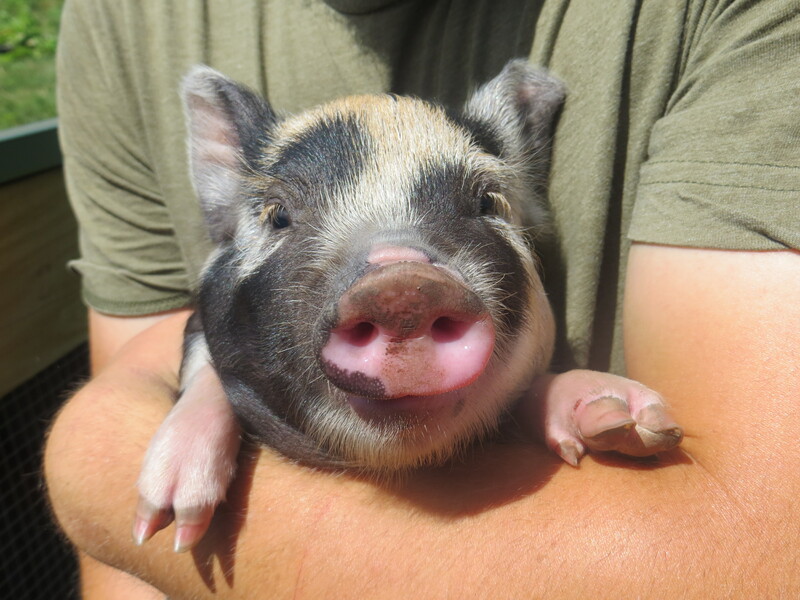 Non-refundable deposit of $25 holds your piglet. 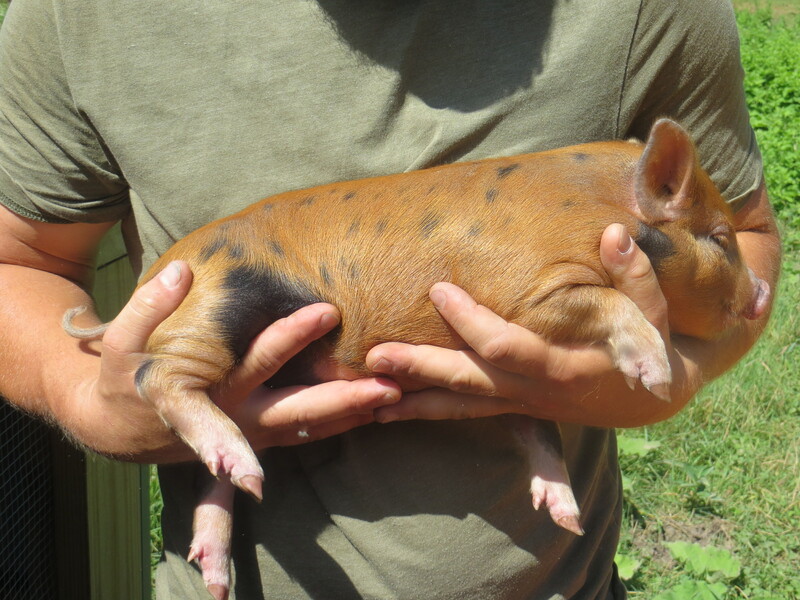 Piglets will not be sold individually unless the new owner already owns pigs. Pigs are social creatures and need to have other pigs around to be happy. 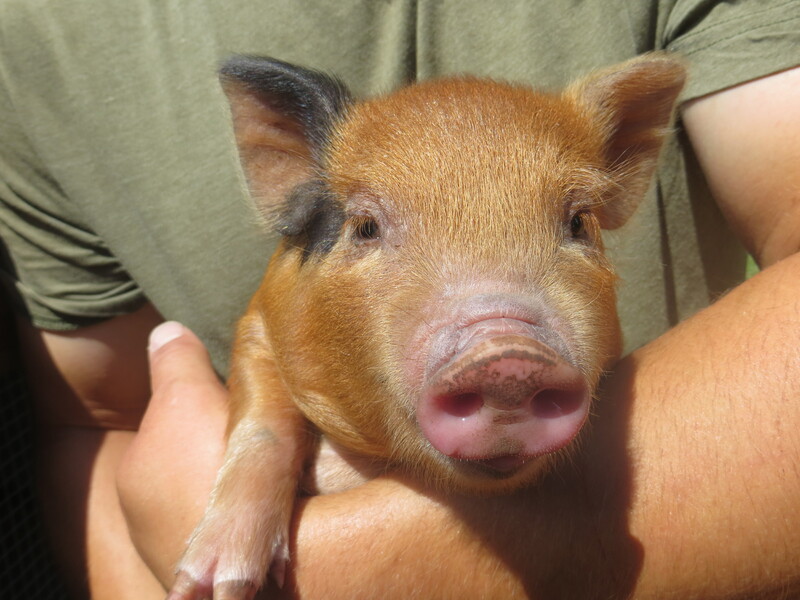 Pigs can be sold as pets, breeders, or pork producers. 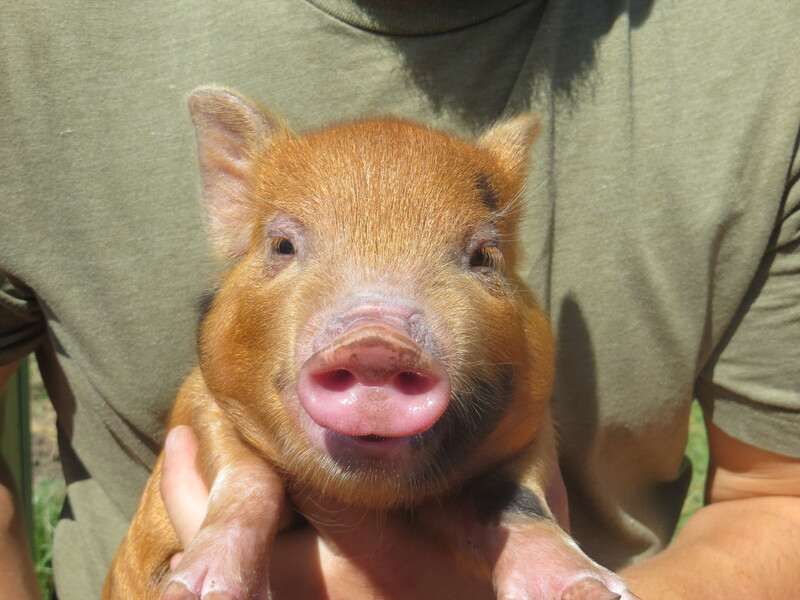 Piglets should weigh 100-250lbs at maturity. This size is perfect for the small homestead. 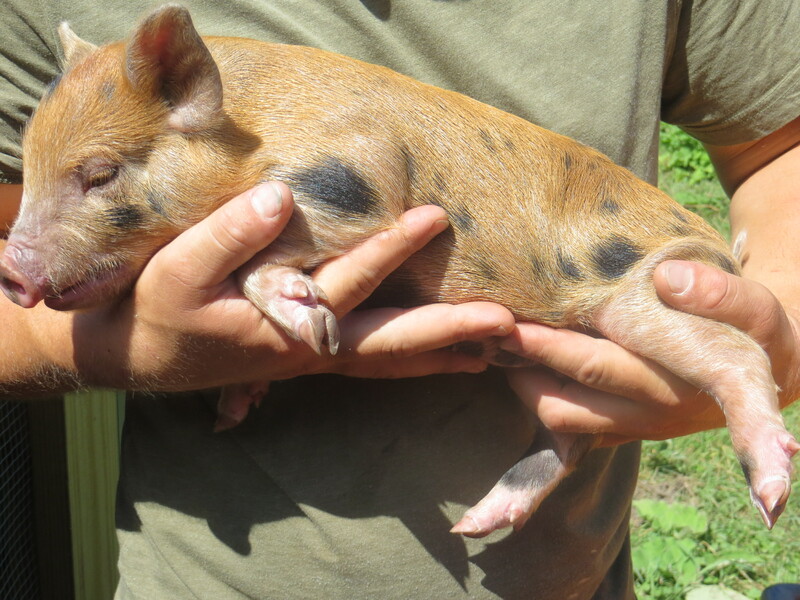 Kune Kune’s are known for their docile temperaments, and are a great pig to raise around children. We recommend pigs live outdoors. BARROWS- We have decided to keep the barrows for meat production. Gilt #1- “Tri” This gilt was born looking black and white but she now has ginger hairs growing in her white areas. 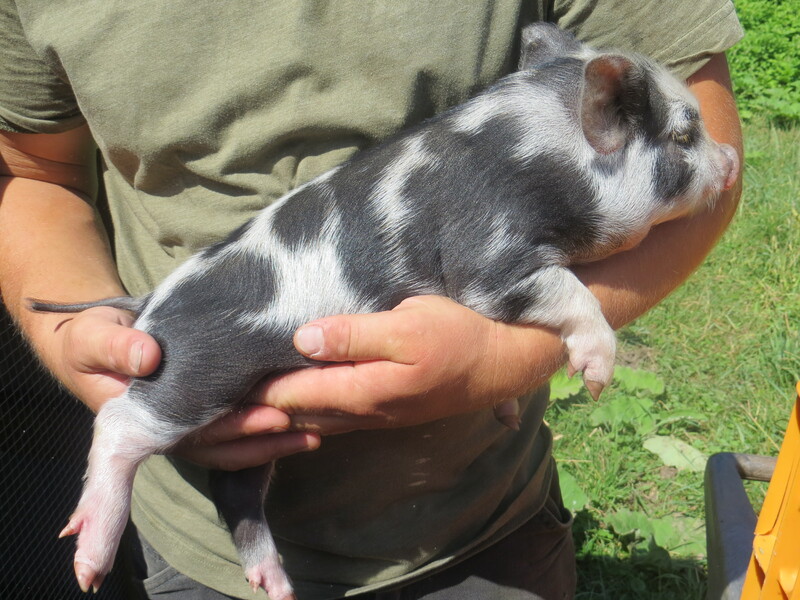 She is the only pig in the entire little to be tri-colored. She has one piri piri (wattle). She does have an extra teat, but could still be bred if desired. Gilt #4- “BJ” Another very curious and friendly black and ginger gilt. She has good teat placement and would make a good breeder.If she doesn’t sell we will keep her and breed her to our Guinea boar. Gilt #5- Has one extra teat.